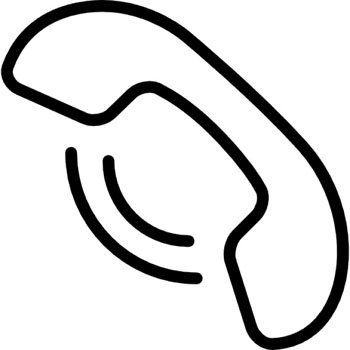 News from Tristan da Cunha's Communications Department and other communications news. and via Tristan Radio on VHF Channel 14, 16, 78 and 80. HFSSB 4000 / 4149 / 6230 / 8294mhz. Head of Communications Department Andy Repetto reports that on 28th October Tristan Radio for the first time ever made radio contact with a plane, Springbok 225 en route from South Africa to South America. 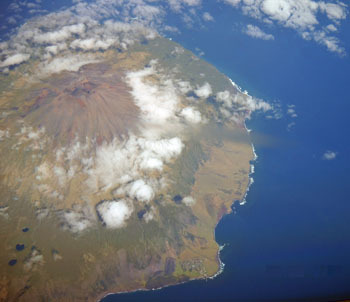 Andy hopes for more contacts, and perhaps photos of the Tristan Islands from future flights. South African Airways presently operates daily flights from O.R. Tambo Airport Johannesburg to Guarulhos Airport, Sao Paulo, Brazil. Of course, Tristan da Cunha has no airport. Helicopters have a maximum range of about 250 miles and so can only be deployed from ships. Tristan's harsh environment and climate, coupled with its tiny population, will make any attempt to construct and maintain an airport impossible, even if it was affordable. Photograph left of Tristan was taken from 34,000ft on board a South African Airbus 340 flight from Johannesburg to Buenos Aires on 23rd March 2011 by Senior Purser Rosslyn Milella. See Aerial Tristan for more photos of Tristan from the air. Tristan has a modern facilities for energy, water, sewage, roads, etc., which are constantly being developed and improved. 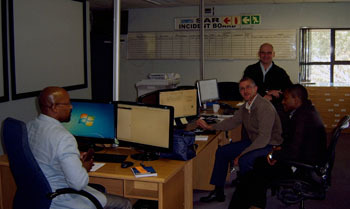 Andy Repetto visited colleagues in Cape Town while passing through on his trip to the UK. 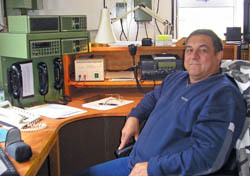 Andrea (Andy) Repetto was appointed Head of Tristan da Cunha's Communications Department in October 2007.